This is one program we probably don't give enough coverage to here on Rewards Canada other than the their Aeroplan bonus promos or occasional 35% offers. The Delta Privilege program is benefit type frequent guest program as they do not award points for the program itself although you can earn Aeroplan or Asia Miles with it. The benefits that the program provides are great even at the basic level, free internet and late check out being the key features that are included in all levels of the program. In fact last winter we had a stay at the Delta Kananaskis Lodge and on the morning of check out we heard there was a bad accident blocking the highway back into Calgary. Rather than being stuck on the highway for hours we were able to enjoy the pool and hot tub on that snowy day since our Delta Privilege membership provided us with 3pm late checkout (non-resort locations goes until 6pm!) Rewards Canada will have a more thorough review of the program in the coming weeks but all we can say is that the benefits get even better when you reach Gold, Platinum or Platinum Plus in the program which leads us into this promotion that launched on November 15th. 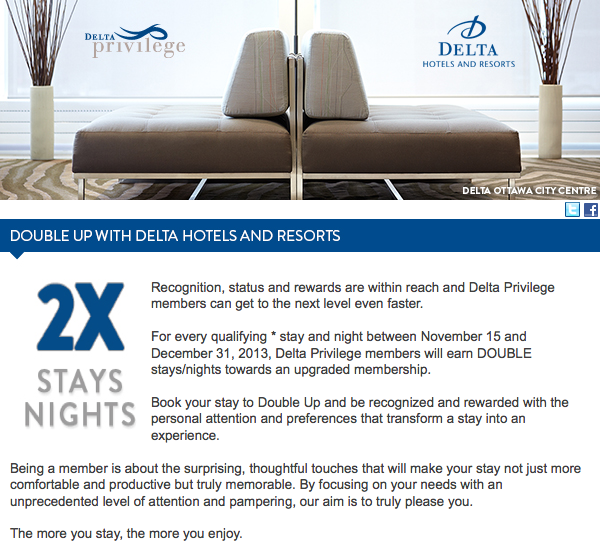 Delta Privilege members will receive double elite status stay/night credits until Dec 31 on all of their eligible Delta stays. Which means you can get Gold status with 3 stays if haven't had any stays yet this year or if you have hopefully this promotion will help you earn Platinum or Platinum Plus status. For complete details on the promotion please click here.